In that competitive, fast-paced, land of over-parenting that we all now inhabit, encouraging your child to come in first place is a no-brainer. But what about when your kid comes in second? How do children – and parents – deal with that? I had reason to confront this question myself recently when my son told me that he was a finalist in an annual reading competition at his school. Every autumn, three children are selected from each year group to stand up before a roomful of parents and teachers and read a passage from their favorite books. My son won the competition last year with a selection from J.R.R. Tolkien’s “Return of the King,” so he was already the defending champion. But what if he didn’t win this time? As the date approached, we rehearsed the passage several times a week. As a veteran of many high-school theatrical productions (and the daughter of an actress), I coached him on pacing, intonation and accent. We re-read the passage over and over, homing in on the really tough bits of dialogue until he got them right. The night before the finals, I felt that he finally nailed it. 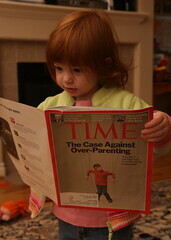 Image: What’s this I hear about over-parenting? by Kevin L. Moore via Flickr under a Creative Commons license. Friendship In Adulthood: What Do You Look For? © 2019 RealDelia. All Rights Reserved.